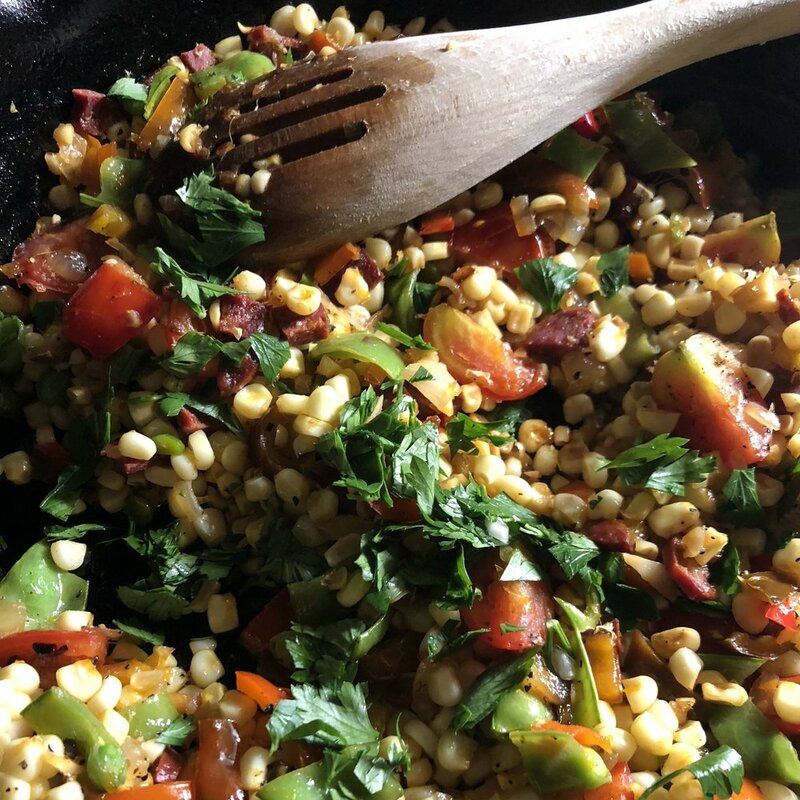 It does not get more American than succotash, one of the first dishes Native Americans shared with settlers. The word, meaning "broken corn kernels" comes from the Narrangansett people, who lived in the area that is now Rhode Island. 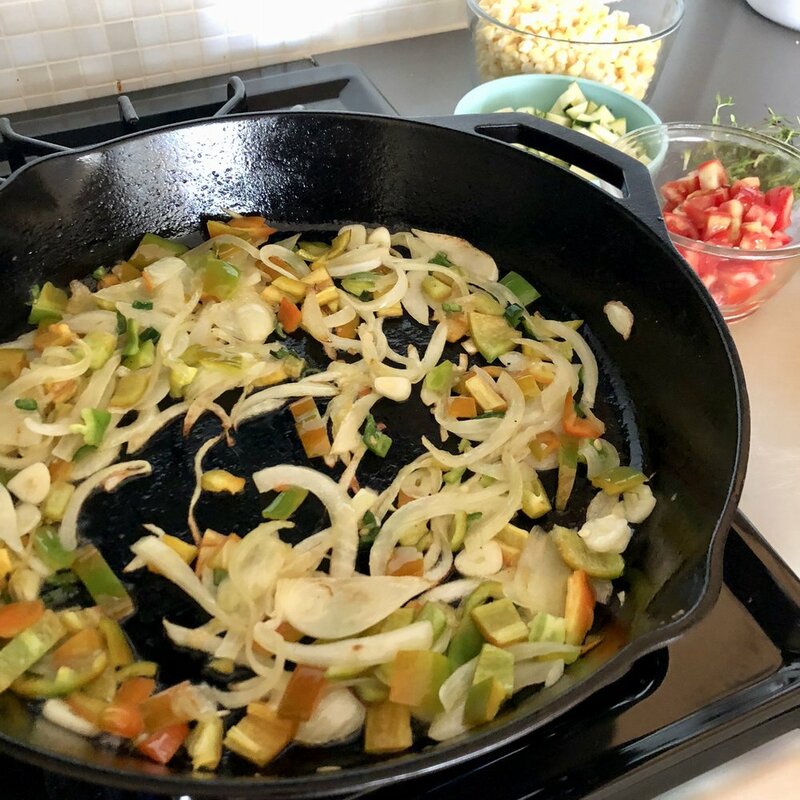 There are many ways to make succotash and an American southerner might eloquently debate a Yankee on both contents and process. 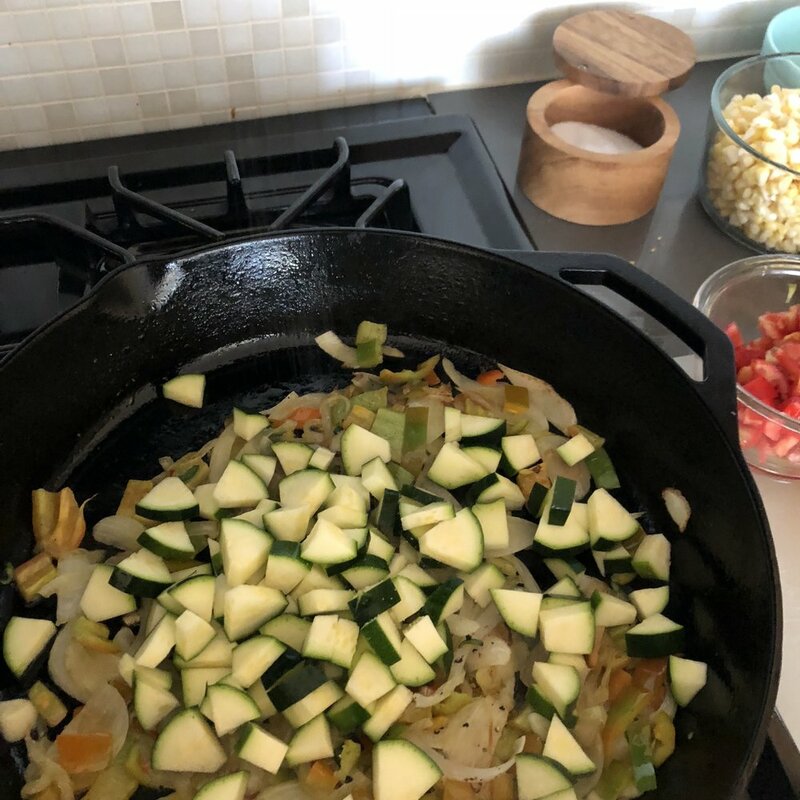 I favor the New England variety, with a few tweaks, but also just assumed succotash translated to "every vegetable from the garden" or "the entire contents of your produce drawer dumped into a skillet." Succotash is the whatever you have at the time kind of dish. Actually -- and perhaps I should put this into the procedure itself -- when making succotash, I open all drawers of my fridge, hunt behind jars and open every container of leftovers, stacking every possible vegetable that can be used on the cutting board along with the tomatoes ripening on the counter. 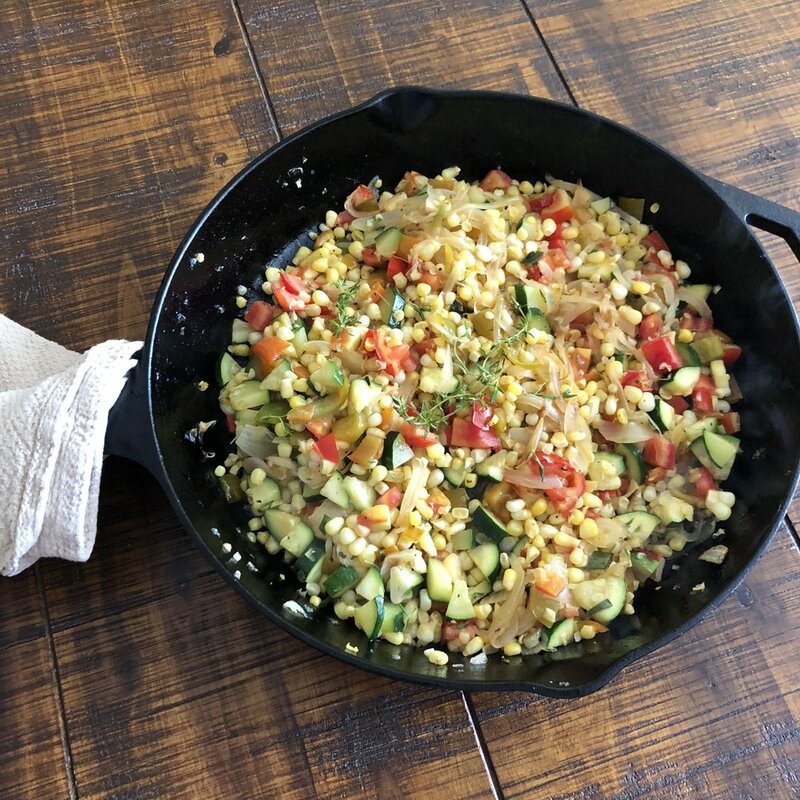 As far as I'm concerned, the only required ingredient in summer succotash is fresh local sweet corn previously cooked or raw. The others you can take or leave or substitute, depending on what you have and what you like. Cut all vegetables into a similar size and shape. Heat a large heavy bottomed skillet (cast iron if available) over moderately high heat. Heat the oil or butter and add the onion with a few pinches of salt. Sauté until soft and lightly browned, about 5-8 minutes. Add spices if using and sauté about 1 minute. Add the peppers, garlic, a pinch of salt and sauté until peppers are softened. Add fresh beans (if using), zucchini and corn kernels with a few more pinches of salt. Sauté 1-2 minutes. Add the water and cook until liquid is absorbed. Add the tomatoes and cook until they break down. 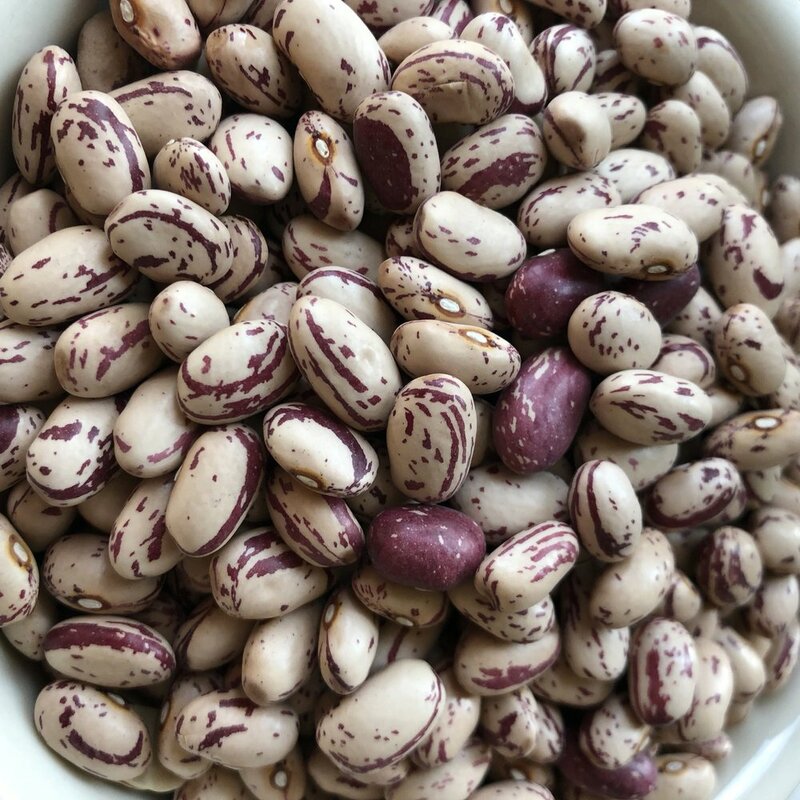 Add cooked dried beans if using. Right before turning off the heat, add the fresh herbs. Note on beans: Traditional New England succotash uses cranberry or "cattle beans" like the ones pictured here. See that beautiful cranberry color marbled throughout? If you can get fresh cranberry beans straight from the shell for your summer succotash, that is ideal. Or substitute fresh shelling peas, snap peas, green beans, or lima beans. You can also cook up the dried ones, like you make any dried bean and add to the succotash at the very end. Use leftover already cooked vegetables, such as corn boiled on the cob or grilled zucchini and squash. Simply reduce the cooking time for the already cooked vegetables. Add them to the succotash a little later than the recipe calls for, omit the water and reduce the salt. Serve the succotash as a brunch hash topped with crispy fried eggs. Push the succotash to the side, add a touch more oil and fry the eggs in the same skillet. In place of tomatoes, try a tablespoon or two of apple cider vinegar or other vinegar. Use salt pork or bacon for the fat. Render the fat in step 2 in place of oil or butter. Add the onion to the rendered fat and bacon pieces. Crisp up small slices of dry salami in the oil. Remove before adding the onion, set aside and return to the dish at the end.